Tuesday, November 27: City Hall Protest: Enforce the Law at Kaporos, New York, NY. 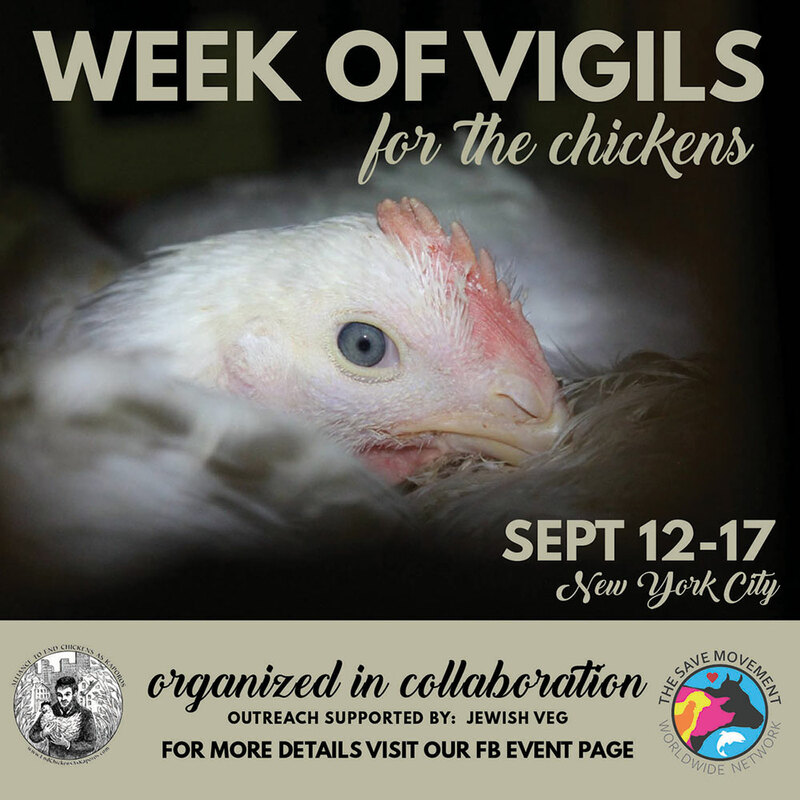 Wednesday, September 12 - Monday, September 17: WEEK of Vigils - Kaporos 2018, New York, NY. 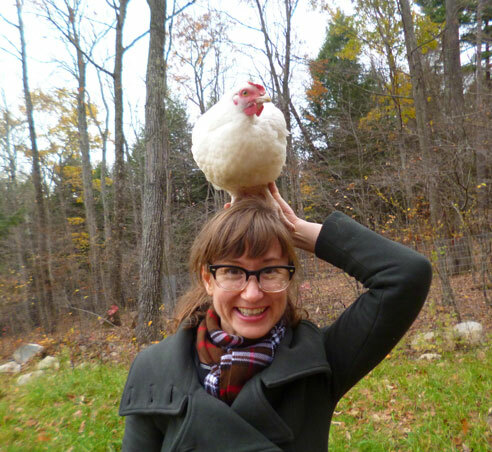 Wednesday, October 17: Court of Appeals, Oral Argument In Albany, Albany, NY “The Alliance to End Chickens as Kaporos, et al. v. New York City Police Department, et al.”, will have their case heard in the Court of Appeals, when attorney Nora Constance Marino, Esq., is scheduled to orally argue the case in the state’s highest court. Thursday, August 30: Kaporos Orientation and Love-Based Training w/Guest Anita Krajnc, New York, NY. Wednesday, June 6: Protest NYC Department of Health, Long Island City, NY. Posters and flyers will be provided. 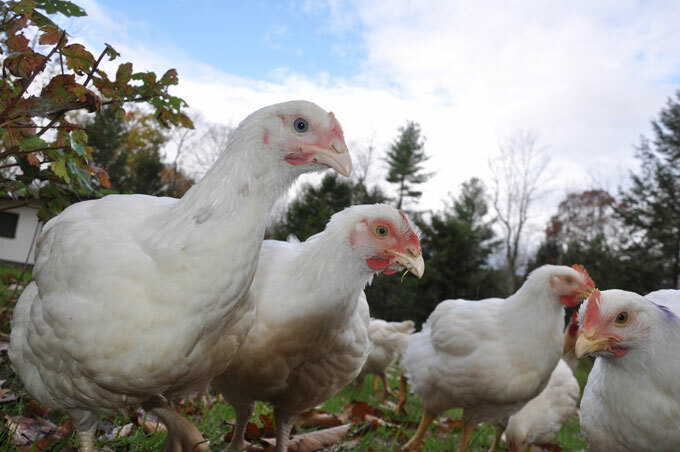 Alliance to End Chickens as Kaporos will seek media coverage. 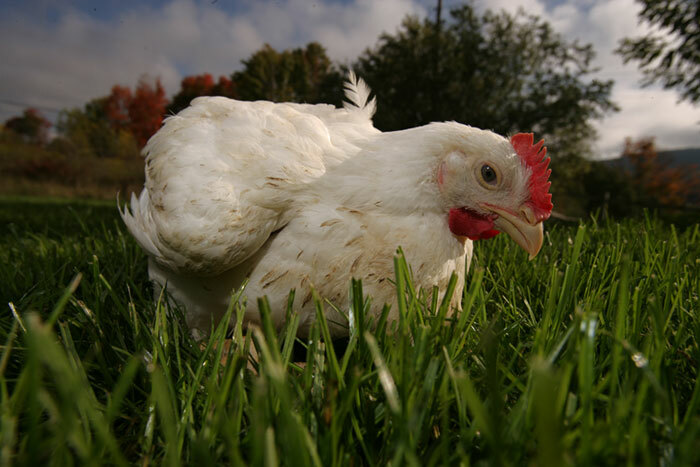 Tuesday, September 18: Oppose the Ritual of Sacrificing Chickens as Kaporos, Chabad of Irvine, Irvine, CA. Sunday, September 16 - Monday, September 17: Vigil for Victims of Kapparot, Woodland Hills, CA. Sunday, September 16: Compassionate Kapparot Ceremony and Demo, Los Angeles, CA. Petitioner’s Reply in the Ninth Circuit seeking an injunction pending our appeal in the federal Kapparot case in which UPC is the plaintiff. Petitioner’s Motion filed August 18, 2017. Defendants' response. Ruling pending as of September 7, 2017. Saturday & Sunday, October 8-9: Protest Against Kaporos, Lakewood, NJ. APLNJ will host a protest from 1-5pm. Meet at 1700 Madison Ave.
Thursday, October 6: Protest Against Kaporos, Chicago, IL. Chicago Coalition For Animal Rights will host a protest from 4:15PM - 6PM CDT at 2935 W Devon Ave.
Geralyn Shukwit/Courtesy Rina Deych A young Brooklyn man participating in a Kaporos tradition of slaughtering chickens to raise money for local synagogues gives the finger to animal rights activist Rina Deych as she tries to discourage members of the community from the practice. 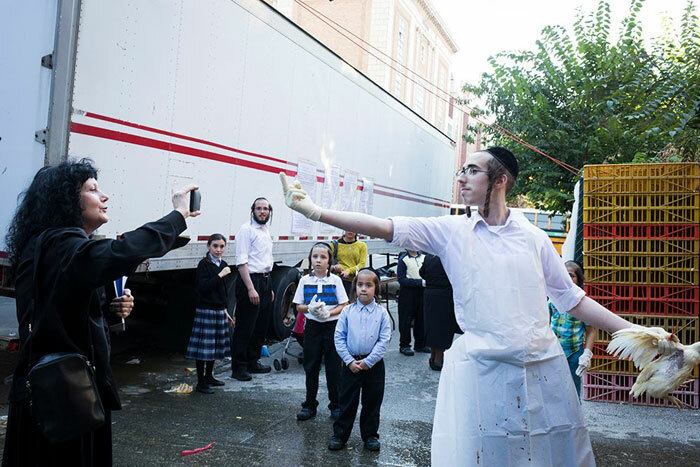 These young chickens were rescued from a Kaporos ritual in Boro Park, Brooklyn, New York on October 3, 2014. Despite being immobilized in transport crates without food or water, here they are enjoying their lives full of energy, curiosity, friendliness and good cheer. Video by Kurt Andernach, And-Hof Animal Sanctuary in upstate New York. Chemers, a baby rooster, was rescued from Kaporos rituals in 2010. This photograph is one of 12 winning photos published in the 2011 Chicken Run Rescue calendar (www.brittonclouse.com/chickenrunrescue). Photo by Greg Straight Edge. One day during Rosh Hashanah - the beginning of the Jewish New Year - a boy overhears the chickens in his village plan a strike. They are sick of being used for Kapores, the custom practiced in his Russian village where live chickens are waved over everyone's heads to erase their bad deeds. "An end to Kapores!" the chickens chant as they flee the town.